Showrooms are the crown jewel of any dealership. It's there customers walk in and get a first impression of a business, and it's there customers meet the salesperson that just might facilitate an extremely important transaction in their lives. Every manager knows that a showroom needs to be clean and perfectly arranged. It needs to be welcoming, not too "overdone" and visually impressive. It's a fine line to walk. And the main culprit is always space. There's never enough of it. 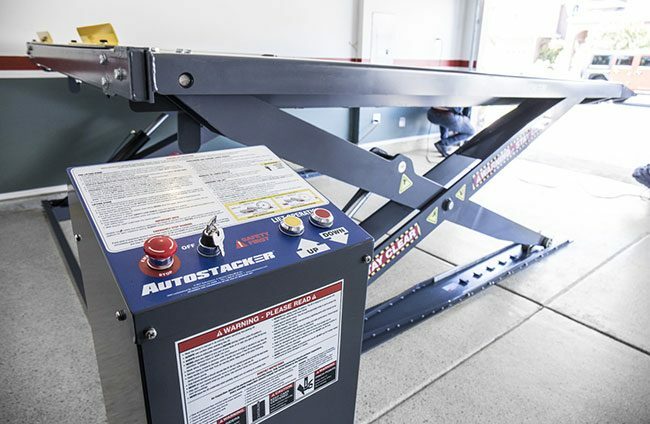 Autostacker is a parking lift that looks unlike any other display tool. Other lifts will ruin the appearance of your space, not enhance it. That's what makes us different. The structure features no posts, and the scissor arms leave plenty of visibility on the sides, so customers can browse two attractively displayed vehicle models in a space that previously held one. Since Autostacker only takes up the length and width of the average parking lot space, you've got nothing to lose and everything to gain by using it to put more vehicles on display without making your space look messy. There are countless opportunities to display vehicles with a little more pizazz than you can using typical car lifts or vehicle raising platforms. If you need an easier way to raise a vehicle and make it seen from hundreds of feet away, Autostacker's 80 inches of rise is exactly what you need. We've even gotten requests from casinos looking to raise that Jackpot prize (a brand new car) for all to see. Most existing lifting methods are either too expensive, unappealing or simply unfit for a crowded setting. Autostacker adapts to any environment, not just car dealerships and industrial parking areas. Thousands of auto shows are held across the country every year, and most people set ramp to drive up on a block, draping their flag over it. Pretty mediocre marketing, if you ask us. Autostacker will make that display pop unlike any other, drive more attention to your booth and hopefully beef up your earnings along the way. Autostacker combines the appeal of a luxury lifestyle accessory with the incredible everyday functionality that will do far more than just accent a room. It creates storage space, doubles the parking capacity of a single spot and raises vehicles higher than other lifts for an amazingly sleek and show-worthy display.